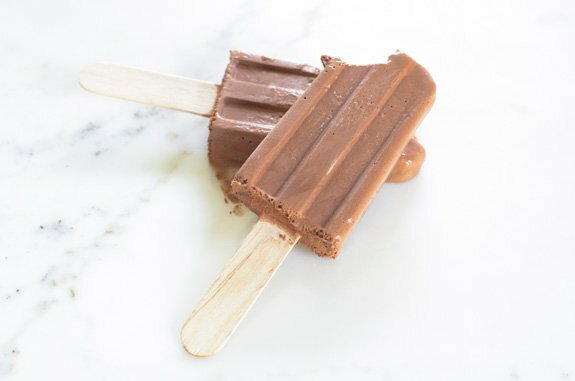 These lightly sweetened dairy-free Fudgsicles are a major hit with my chocolate loving teenage son. I love homemade Fudgsicles because with just 5 ingredients they’re super easy to make. Better yet? This low-carb popsicle recipe is sweetened with only one date for the entire batch! This rich fudgey frozen treat also has a bit of stevia in it, which you can likely omit entirely or replace with some other sweetener of your choice. If you do experiment with this recipe, please stop back by and let us know how it goes! I made these Fudgsicles around a dozen times to get all of the proportions just right, so I haven’t had a chance to enjoy trying substitute ingredients to the recipe below. I have a couple of new and more unusual ingredients in this dairy-free Fudgsicle recipe –vanilla powder and 100% chocolate. Vanilla powder is a fantastic ingredient. Be sure to buy pure vanilla powder so that you don’t end up with the type that has added sugar or corn starch. Vanilla powder is simply pure vanilla beans, excavated from the pod for you –it’s amazingly fragrant! The chocolate I use in the recipe above is basically a bar of unsweetened baking chocolate. I use this in order to control the amount of sugar (of any sort natural, or otherwise) that I am consuming. I’ve been cutting way back on my consumption of sweets lately, avoiding sweet fruit and staying away from baked goods even if they’re made with unrefined sugar, or natural sweeteners. When the boys were little the 3 of us were on this diet for several years –no joke. Back then we called it the candida diet, and we really needed to be on it as one of the boys and I both had pretty bad candida overgrowth in our systems. Now we’re all healthy enough to eat anything we want –well, not gluten or grains, those are big no no’s for me as I cannot digest them and so don’t even indulge occasionally. With these types of eating restrictions, healthy paleo desserts like my homemade Fudgsicles, really hit the spot on a hot summer day. I’ve been posting a bunch of fun photos of food and our house on my Instagram page. I recently shot one of a melted fudgsicle and shared it over there. If you make these popsicles be sure to post a photo of them on Instagram and tag it #elanaspantry so that I can see it! Here are some of my other paleo dessert recipes that are great for summer! I don’t see the nutritional facts on this? Can you tell me the carbs, fat and protein of your recipe? These are incredible! I had a bar of dark chocolate with cherries on hand and took the suggestion of another reader to melt the chocolate. I don’t have a Vitamin but used a Ninja and thought that melting the chocolate would help. My daughter isn’t officially on a Paleo diet but has a terrible sweet tooth that I’m trying to curb. As a compromise so that she’ll actually eat them, I used three dates to sweeten them up a bit and no stevia. Delicious!